Congratulations on this book. I can’t wait to get it, hack it, and get to printing! Love your idea of Wet-studio proofing the book! I enjoyed meeting you at Craft Napa. 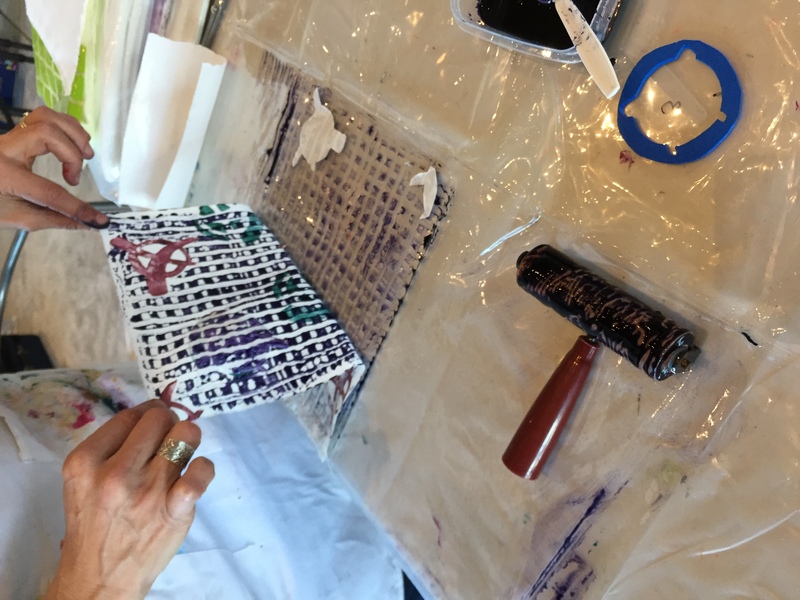 Thanks for showing me how to work with thickened dyes and create prints when we don’t have optimal studio space. Less scary. Not ready to cut up my beautiful book, but I like this idea. May just have to get another copy! the book looks great! I just put in my order…. And what a great idea about the spiral binding..I will have to see if anyone in my city does that! Love the way you hacked the book! Congratulations!!! Awesome book! 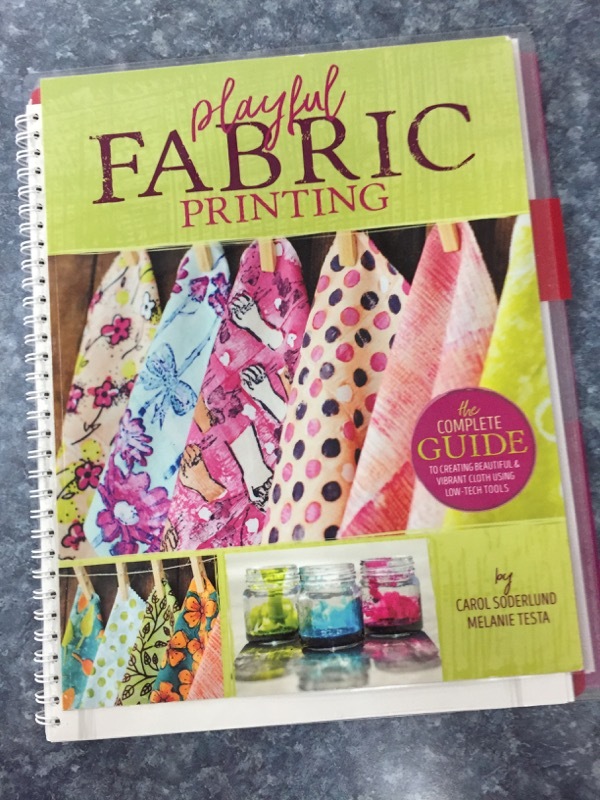 I love the spirial binding and laminating the covers – what a great idea!! Thanks for sharing! Congratulations on your book! Looks like a lot of fun! Thanks for the chance to win a copy. What terrific info! I’m eager to try the freezer paper technique and to hack my book. Such a helpful idea. Congratulations, so much info and helpful ideas. Great idea to bind the book. I’m heading out today. Great ideas on making the book studio ready ! Congratulations again, Melanie ! So enjoyed talking with you in Napa. Your passion was contagious and I can’t wait to start printing beautiful fabric! The book looks fabulous, I’d love to win a copy. Then I could try out your waterproofing idea. I hope…to win a copy! Melanie, you’ve done wonders! Even if I don’t win, I’ll be getting a copy. And there will be lots of books being hacked very soon. What great ideas! This looks like the dyeing book I’ve been looking for. Would love to have a copy. Great ideas about taking it apart for an easy to use workbook. 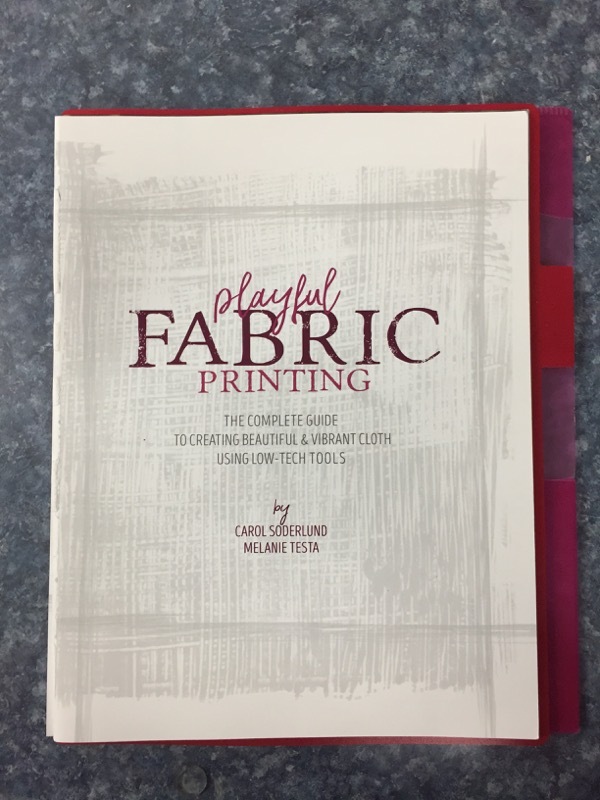 I love that this book is a collaboration of two great fibre talents and also that you have been fearless in showing us all how to make it more functional and durable. Congratulations and wishing you great success! Great idea to hack a book and yours looks wonderful. Way-cool idea to re-bind your book with a spiral binding!! Great book hacks! I recently added a spiral binding to a book, but you go WAY beyond! Rearranging pages, even…nice! Congratulations on your book – looks like a must have! 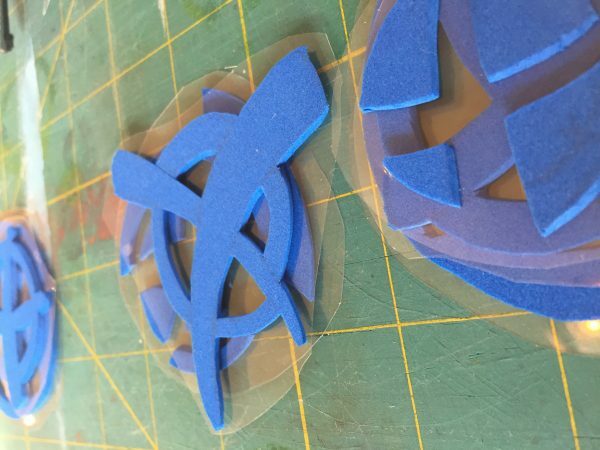 Never thought of doing a hack as you’ve shown but it makes sense & thanks for sharing the print technique too. This looks awesome! Can’t wait to see the book in real! One of my copies was destined for spiral binding, and your post has given me some additional ideas. Thanks. It looks like such a lovely book. You are such an organizer as well. Great ideas for making it studio friendly! Would love to have seen the person’s face at the office supply store. But I’ll bet you had done this before. This is a wonderful idea for books much used in a messy environment. Thank you. So excited to receive this book! I will definitely make the changes you recommend to make it an EVEN better book!! Thank you! I too love the hack. Too many soggy books in my studio. This looks like a fantastic resource. And I love the way that you have customized your book! I have put spiral binding on some of my well loved resource books bot not thought to put additions to it. Brilliant! I hope I win a copy of your book but if not it is going on my wish list! Great ideas for making our books more user friendly. Thank you. Have heard nothing but good things about this book and very user-friendly idea with the hack. Thanks for all your hard work. Looks like a fantastic book! I can’t wait to get a copy and customize it for the studio! The book likes like too much fun! And the book hack has me think about a boule of others as well – – why not rearrange pages and add tabs?! My copy arrived and it’s a dream! So VERY detailed and so VERY inspiring. And it’s beautifully laid out! 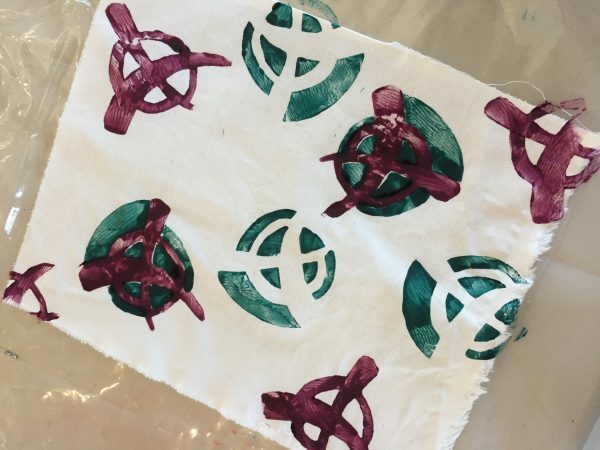 I’ve been doing a lot of small scale fabric printing with a variety of tools with fabric paint and I’m eager to test out repeat patterns and small scale dye printing. Clever your remake of a book. Will keep it in mind. This book looks very interesting, especially as I have been looking for information about dyeing fabric! Always on the lookout for playful books on printing. This book looks like a goldmine. 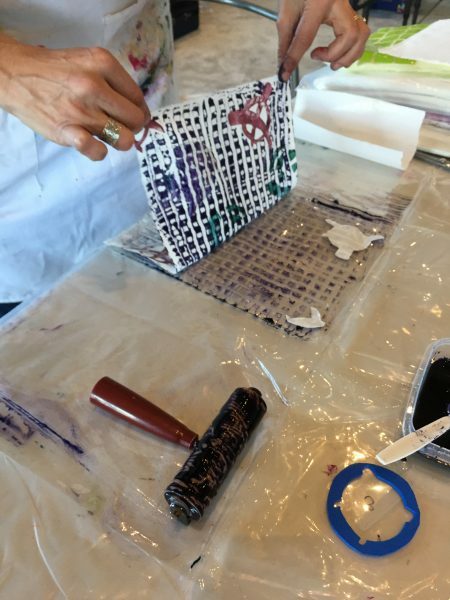 I do some printing with my gelli plate on fabric. What a great idea you did to alter your book for the studio! I never would have thought of doing that! I’ll have to consider that for some of my books! Congrats on the book release! Love your ideas of how to make this work for you. Gee, I never thought to take a book apart and replace the binding. Brilliant! Great ideas for making it easier to use the book! It really looks interesting! This looks like a great book. 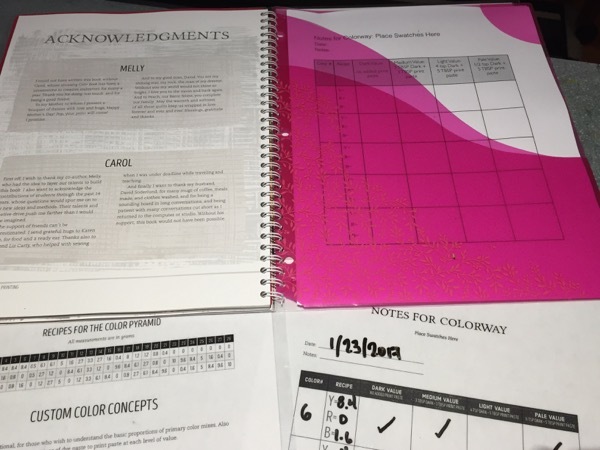 I love the way you have made it your own workbook, so much more useful than having it as a pristine reference on the the shelf. Congratulations on the book Melly! It looks fantastic. I can’t wait to get my grubby little hands on it! you make it look like so much fun! so great the book has come out! I was lookign forward to it for some time. What a chance you give for a copy to be won; hope it’s me!! Wow, what an accomplishment. Kudos to you both on the publication of your book. 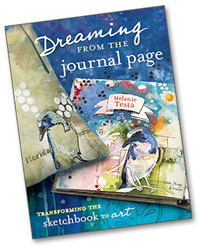 It looks like it would be a great addition to my art books’ library and a wonderful resource. Love the hack! Thanks for the chance to win a copy! All the best! This book looks like fun to dive into! 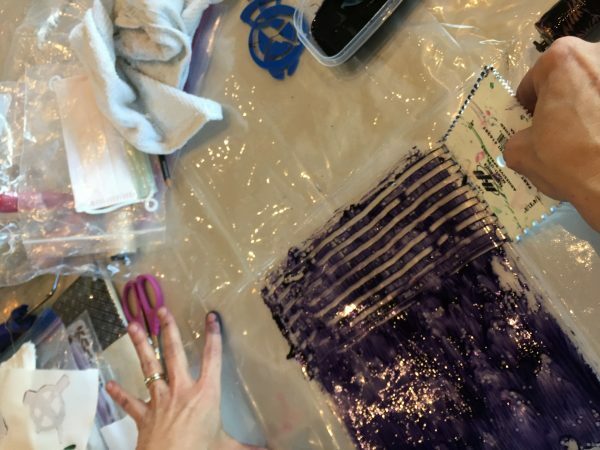 Love painting, stamping and mono printing on fabric. 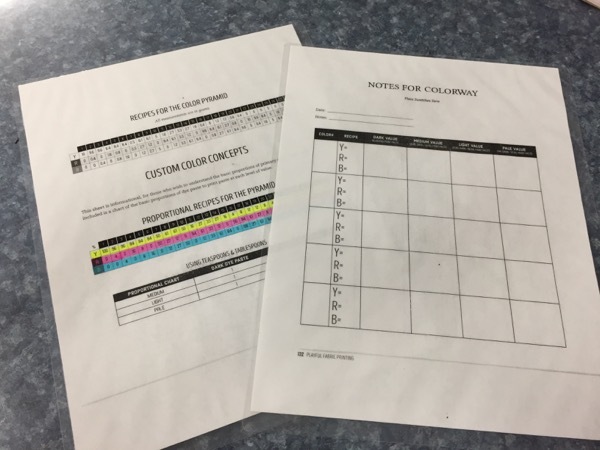 Haven’t tried Thermofax yet! Love the idea of making the book studio ready! Can’t wait to see inside the book too! This looks like a fabulous book with lots of way to play. Congratuations. Congrats on the book and thanks for the hack and a chance to win! I’d love to have this book! Thanks for the info! 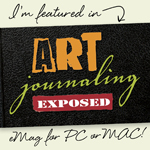 I saw your book featured on Julie Balzer’s blog and came here to see what you have done. congratulations on the release. 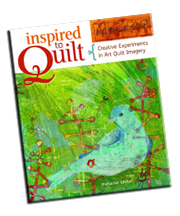 I’m SO excited to get my hands on your *wonderful* book and get started creating! 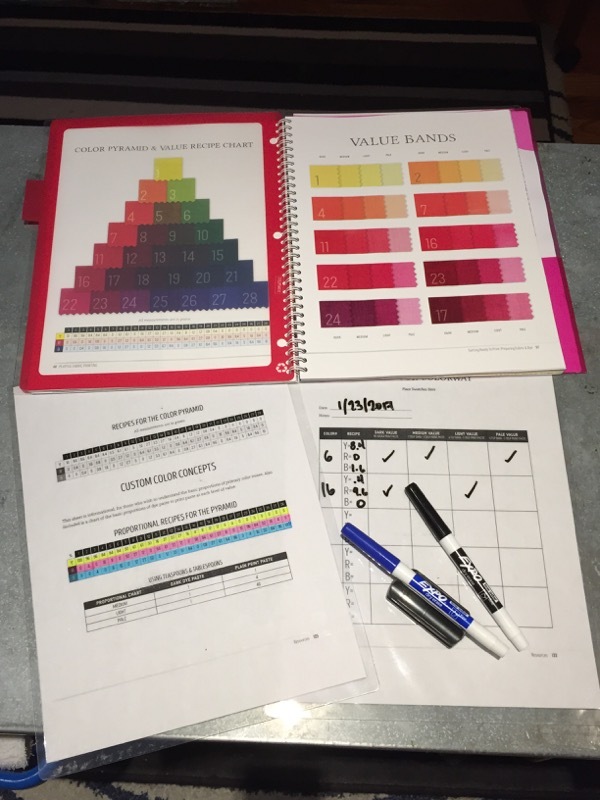 Thank you for the guide on making it a wet studio workbook, too!… I will do that! I’ve had a 10 yard bolt of PFD fabric just waiting for me…. for 3 years? I think it is time to get off my duff and play! Your book is providing inspiration. Adding a spiral binding to the book is a great idea. I often do that with books I’d like to use as a workbook. I REALLY like the addition of the lamination of the front and back pages and the pocket. Great idea. The book looks fabulous; can’t wait to get it. Congrats on the book. I like the spiral idea. Its so much easier to use a guide when the book lies flat. Just curious why it wasn’t printed that way in the first place? A publisher’s decision? This looks like a fabulous book! I have wanting to give it a go and this would be the perfect way to begin!! The “Hack” is a great idea! 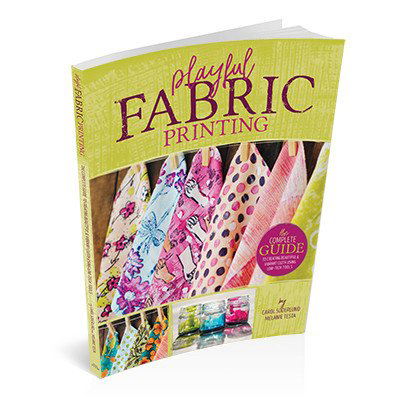 Learning how to design and create my own fabric is now on my to-do list for sure. Hope to take a class from you some day soon. 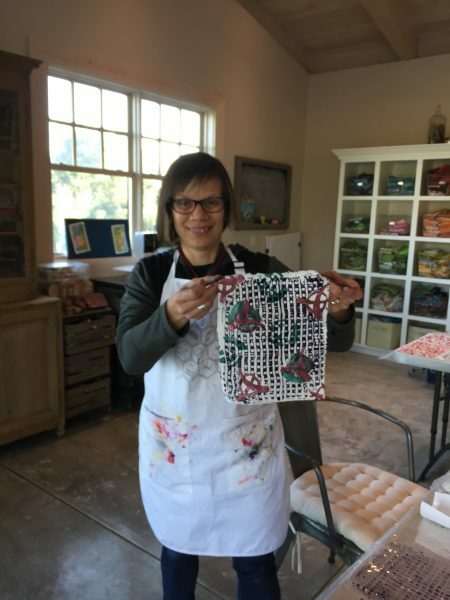 Thanks for arranging this blog hop just on fabric painting. Hi Mellanie. I love your projects and posts. Have some of your fabrics and journal book. 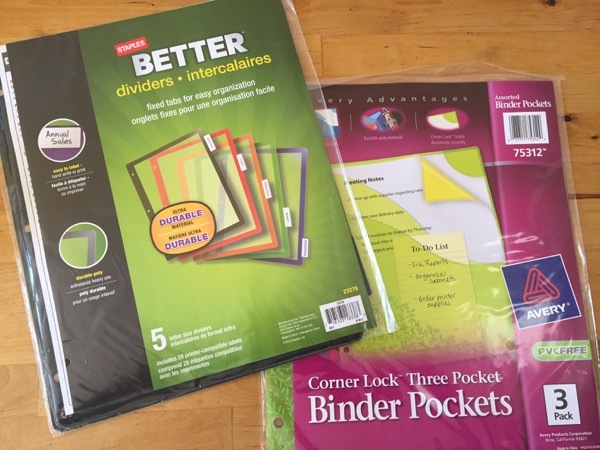 I love your idea of spiral binding your book and adding the folders. I am going to do this when I get mine. I haven’t had much time lately to really read blogs, but I am doing a catch up and I thrilled about your book. Neat idea spiralizing your book.